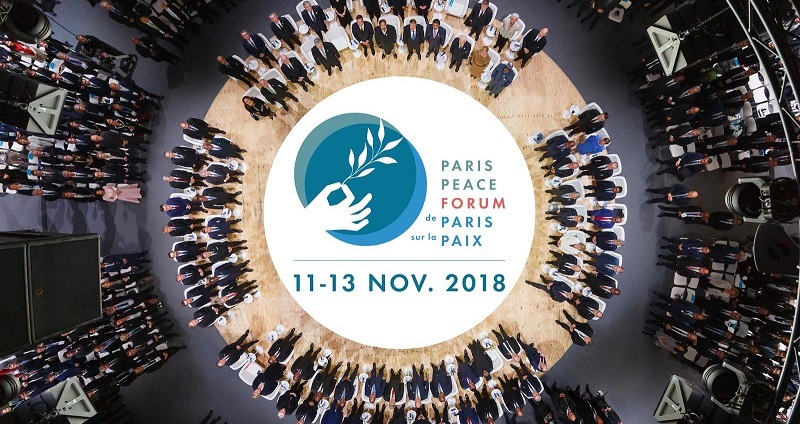 ESA astronaut Claudie Haigneré attended the Paris Peace Forum this weekend, presenting the Agency’s vision for engaging humankind in multilateral cooperation for space exploration with peaceful objectives. An initiative launched by President Macron of France, the Paris Peace Forum is an annual platform for global governance projects and was conceived as a response to tensions in the contemporary world. Taking place this year on 11-13 November, the centenary marking the end of the First World War, the event includes the attendance of over 60 international Heads of State. Based on the belief that durable peace can only be achieved through international cooperation in several sectors, including space exploration, the Forum was an ideal opportunity to present ESA’s ‘Moon Village’ vision. This foresees a peaceful global cooperation to achieve a space landmark for humankind in 21st century, realizing the potential of humankind as spacefaring species, while providing benefits and opportunities to as many people as possible on Earth. The Moon Village concept was introduced three years ago as a proposal for the post-International Space Station space program. Over the last few years, plans to return to the Moon have gained interest and moved up the agendas of government, space agencies and private entrepreneurs. A number of initiatives and missions are under way: from the US-led Lunar Orbital Platform-Gateway and Chinese plans to explore the Moon, to European initiatives conducted through ESA. All these efforts converge towards a common goal: returning to and going forward to the Moon establishing a permanent presence. But, although international in nature, these projects still replicate to some extent the ‘competitive approach’ of earlier ventures. They lack the global approach that would maximize results, allow wider participation, inspire younger generations and further mutual understanding and cooperation. ESA has been working to promote this approach, also reaching out to non-space potential partners and other interested parties. This is the chance to rally the whole international community around a truly global vision where, through suitable governance mechanisms, any nation can be part of the effort regardless of their actual space capability. Claudie Haigneré said, “Mobilized together towards this new step of humankind’s expansion, let us leave aside our national divisions and rivalries. As we move from our planet Earth, our cradle, let us grasp the opportunity to think differently in terms of multilateral cooperation, peaceful objectives, and respect for diverse interests and preservation of our common interests. “We share the values that are promoted in this forum: respect, peaceful objectives with soft leadership and inclusiveness for inspiration. The spirit of the Moon Village is not taking part in a space race or competition, but an expression of cooperation, shared responsibility and sustainability. Claudie Haigneré and Piero Messina were accompanied by ESA Director General Jan Wörner with the support of ESA astronaut Frank De Winne, Head of the European Astronaut Centre in Cologne, Germany.